When the time came to buy a router table Ifigured a shaper would be a better choice. It cost only a littlemore than a quality router table, but was a stand alone machine.The motor of the grizzly I settled on was much more powerful thanmy router's, plus I did not have to buy all the cutters twice. Iwas sold on the idea and bought the G1035 shaper from Grizzly. Shapers get their name from their ability to shape wood using a rotating cutter head. They function just like a router table. A spinning cutter mounted on a spindle cuts a profile into a piece of stock fed across the cutter with the help of fence. Shapers differ from router tables in their ability to support much larger cutters. A shaper has a home in every woodshop. 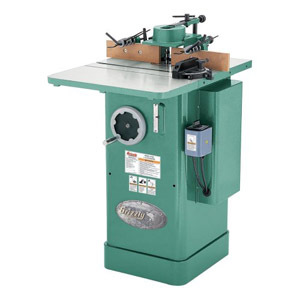 Due to its size and power, it greatly simplifies certain cuts that are just too hard to do on the router table. Shaper cutters also outlast router bits by a significant margin. In the long run, a shaper is the better router table. Let’s take a look at what makes a shaper a good shaper. The spindle of a shaper adjusts up and down. This motion moves the cutting surface of the cutter up and down relative to the table and the work piece. The operator must adjust the height of the spindle such that the cut happens at the right height. On most machines the height adjustment is done with a hand wheel. Some machines offer a power-lift option.Almost all machines have a built in scale for measuring the height of the spindle. On the premium machines a digital measuring system replaces the scale. This feature greatly improve tool changeover times and reduces error. The two sides of shaper’s fence can be adjusted in our out. This adjustments exposes more or less of the cutter head. For example, when a panel cutter is used, the location of the fence determines the width of the panel surround.On most shapers the fence is locked into place with a lever or set screws. On CNC shapers the fence is fully motorized. The speed of the cutter head needs to be adjusted to manage burning and tear out. Smaller cutters work best at high speed; larger cutters at low speed. A system of pulleys and belts is used for that purpose on most machines. Very few shapers have a continuous range of speeds. Beyond the basic operation, shaper come with many features. Each feature extends the range of operations a shaper can perform. The height of the spindle, or the height under the nut, determines how much space is available on the spindle for cutters. This is important doe cuts made with multiple cutters contacting the work piece. Not all cutters have to be involved in the cut. It’s possible to cut with one, adjust the height of the spindle, and perform a second cut with the other cutter on the spindle while the first cutter spins under the table’s surface. This technique saves time. Spindle height is a minor consider, since most shapers offer ample room for 2 or more cutters. If you plan on running a production environment where speed and single pass performance are paramount, look into spindle height. Four inches or more are plenty for occasional use. The size of the table opening effectively sets the maximum diameter of cutter the shaper can spin without cutting into its own table. Typically the table opening can be adjust by removing one of more concentric rings. Ideally the table opening is just little bigger than the cutter in use. This ensures maximum support for the work piece and minimizes tear out. Raised panel cutter and cutters with removable inserts have the largest diameter of cutters in use today. Make sure your shaper supports the cutter you want to run. On tilting shapers the spindle can be tilted in and out. This changes the shape the cutter head leaves in the work pieces. What used to be a 45 degree cutter can become any angle. The titling feature is not strictly necessary. Purchasing a cutter head with a different profile removes the need to tilt the spindle. If you plan on making mostly standard cuts, changes are there is cutter available that suits your needs. The tilting feature allows you to be creative. Sliding tables are an asset for making cuts along the short side of a board or on boards that are no longer than the sliding table. The hold down on the table make for a well-supported, clean cut. If you plan on using a power feeder, a sliding table can be problem. It must be locked into place while the feeder is in use. While the operation is serviceable, the locked sliding table still adds a bit of awkwardness. Because of this, most commercial shops have one of each kind of shaper. If you only want to own one, the fixed table machine is the more versatile of the two options. Just like router bits, shaper cutters only cut when spun in a particular direction. The direction of rotation determines which side of the shaper the piece must be fed into the cutter. On shapers with reversible spindle rotation the operator can decide which direction the spindle turns. It opens up new options for feeding the work piece. Some cutter combinations require the spindle to run in reverse. The spindle can be removed on all shapers with varying degrees of effort. Some models, however, offer a quick release. The spindle can be removed at the press of a button. This feature dramatically increase tool changeover time. The operator simply replaces the spindle with different one. Power feeders and shapers go hand in hand. Feeding long stock into a shaper at a consistent speed is tiring and, in some cases, difficult. A power feeder produces a better result with much less effort. If you plan on using your shaper regularly, you should look into purchasing a power feeder. These units can be retrofit onto most shapers. The most important criteria to get right when purchasing a shaper is the motor size. Entry level machines come with 1-2HP single phase 110V motors. While these machines are perfectly capable of running smaller cutters in hardwood, they will quickly bog down when used with larger cutters. Stacking cutters is pretty much out of the question. These machines are still a good buy, if you don’t mind having to do multiple passes per cut on occasion. 3HP/220V are the magic numbers for occasional use. At this level of power your shaper will be able to spin any single cutter through just about any wood. Stacking cutters becomes a viable option, but you’ll run into limits pretty fast. A power feeder is a viable option with these models. True versatility requires 5HP or more. At this level your shaper will cut anything you throw at it, and it will do it fast. After choosing a power level, you have a wealth of features too choose from. Features that make setup easier should be top of your list. A shaper will only cut as well as it's setup. A quality spindle height adjustment feature and easy fence lock-downs are vital. High quality shapers make it easy to set the spindle and fence in the same position time after time. Your cuts will be repeatable and accurate. If you have picked a shaper with enough power and easy controls, you are well on your way to picking the perfect machine for your needs. "A true tank of a shaper. The powerful motor can do it all. This tool will never leave you wanting for more power or quality. The best non-CNC shaper." "The G1025 is an entry level shaper. It is underpowered for tough work, but is built with precision. If you need a shaper for small tasks, this is a good option."